For all those who believe Valentine's Day was invented by Hallmark and candy companies, take heart: the truth lies almost two-thousand years back, in ancient Rome, when the Ides of February was celebrated as a pagan fertility festival. Later, in the 5th century, the Catholic Church co-opted the Roman ritual as St. Valentine's Day, and it has been celebrated on February 14th ever since. St. Valentine himself is shrouded in mystery, but he has been associated with romance for centuries and love birds were exchanging written valentines by the early Renaissance. Now that you know St. Valentine's day is not just for saps who buy into Hallmark's brilliant advertising campaign, here's an idea for bringing this holiday back to its unadulterated romantic roots. 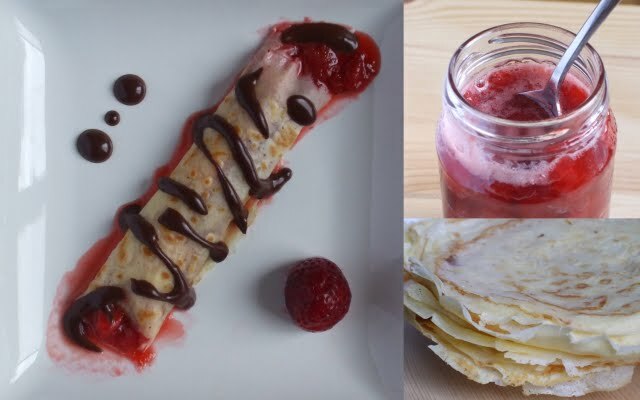 This Tuesday, why not forego gift-buying and card-giving, and instead show your love by preparing a special homemade meal - and what better way to say "I love you" than with crepes filled with homemade strawberry compote and bittersweet chocolate ganache? It's a veritable culinary ménage à trois: crepes are a Parisian staple, and no city is more often associated with romance than Paris; strawberries have long been considered an aphrodisiac; and chocolate... well, I think it speaks for itself. Although most people would serve this dish at brunch, there's no reason you couldn't serve it for dinner - and if you want a savory meal, you can fill some crepes with cold cuts or smoked salmon and fill the rest with the compote and chocolate for dessert. Because it's never too late for a little homemade romance. The recipes are listed in the order in which you should prepare them. 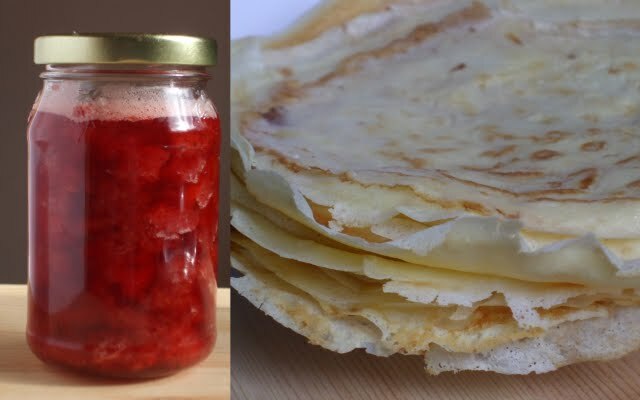 Begin with the strawberry compote, and once you've set it to boil, move on to the crepes. 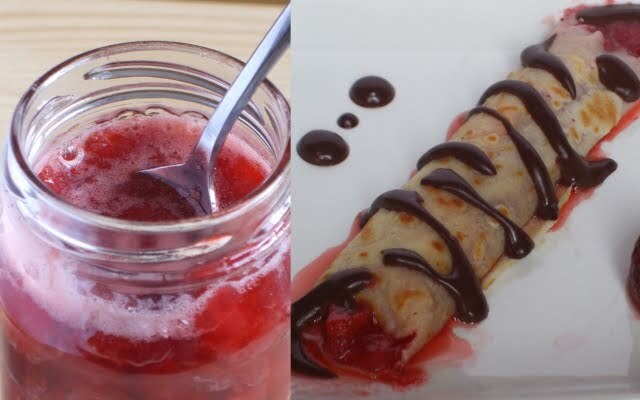 Once you have finished both the compote and the crepes, make the chocolate sauce - it hardens fairly quickly, so you'll want to drizzle it on the crepes just before serving. 1. If you're using frozen strawberries, place the fruit in a large bowl and cover with hot water from the tap. Let sit for 5-7 minutes, then drain. For a chunkier compote, cut the strawberries into eighths. For smoother compote, mash them or blend them in a mixer prior to boiling. 2. Place the strawberries, sugar and lemon juice in a pot over medium-high heat. Bring to a boil, then reduce the heat to medium-low and let simmer for about 20 minutes or until thickened. To test the consistency of the compote, place two tablespoons of the mixture into a small bowl and put it in the freezer for 2 minutes - the compote should move very slowly across the bowl when you take it out. If it's still runny, boil for another 5-6 minutes and test again. 3. When it is the desired consistency, turn off the heat and let the strawberries cool before storing them in an airtight container. This recipe makes about 1 1/2 to 2 cups of compote, which will keep in the fridge for one to two weeks. 1. Place all of the ingredients into a mixing bowl and mix until the batter is perfectly smooth. 2. In a small or medium saute pan, place a small piece of butter over medium-low heat. When the butter has melted, use a soup ladle to spoon in just enough batter to thinly coat the bottom of the pan and swirl it around to spread evenly. Usually about 1/8 cup of batter is sufficient, but you may have to play around with it on the first few tries - for thin and delicate crepes, apply the smallest amount of batter that you need to fully coat the bottom of the pan. You may need to occasionally add more milk to keep the batter runny. 3. Let each crepe cook for about one minute on the first side. When the crepe pulls away easily from the pan, it is ready to be flipped. (If you're a visual learner, see this short video on spooning out batter and flipping crepes.) Let cook for about 30 seconds on the second side. 4. Place finished crepes on a large plate and keep them covered to maintain their moisture. This recipe makes about 15 small- to medium-sized crepes, depending on their thickness. If you're making chocolate sauce in large batches, it's best to make it on the stovetop. However, if you're preparing dinner for two, you can save yourself the trouble and simply make it in the microwave. 1. Place the chocolate chips and the milk in a small bowl. Heat in the microwave for about 30 seconds (note: microwave strengths vary; if yours tends to be more powerful, heat for 20 seconds, then add more time as needed). The milk should be steaming slightly when you take the bowl out. 2. Whisk the chocolate and milk until smooth. It should be just runny enough to drizzle over the crepes; if too thick, add another one-half tablespoon of milk and whisk, reheating in the microwave for another 5-10 seconds if necessary (adding extra milk in tiny batches will ensure that you don't make the sauce too runny. However, if that does happen, simply add a few more chocolate chips to thicken). For more on the history of St. Valentine's day, see http://www.history.com/topics/valentines-day.